Here is one way to analyze the recent Breitburn transaction. The Breitburn transaction includes 4.7 net wells and 403 net acres for $19.3 million. The price per acre equals $48k/acre which can be assigned to proven/developed acreage. The transaction equates to approximately 86 acres per well. To approximate the amount Lynden’s developed and undeveloped acreage, one can multiply their net wells by 86 devloped acres/well. 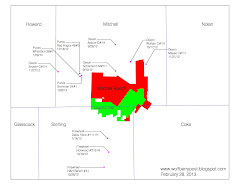 Lynden has a total of 33.0 net wells equaling 2,830 developed acres. With a total of 6,466 net acres, Lynden’s remaining undeveloped acreage equals 3,636 acres (6,466 – 2,830). After the sale to Breitburn, Lynden will have 2,427 remaining developed acres (2,830 – 403). Assigning a value of $48,000/acre to Lynden’s remaining developed acreage and using a conservative number of $10,000/acre for their remaining undeveloped acreage results in a Wolfberry value of $153 million (2,427 acres x $48k/acre + 3,636 acres x $10k/acre). These conservative numbers result in a fully diluted share price of $1.07/share ($153 million / 143.5 million shares). Using $20k/undeveloped acre results in an additional $0.25/share. Mitchell Ranch is still a very exciting upside opportunity. With other companies delineating resource potential around Mitchell Ranch and Lynden interpreting their own seismic data, Lynden’s 34,150 net acres could become very valuable. At $2k/acre, the Mitchell Ranch property could add $0.48/share and at $4k/acre the upside could be $0.95/share. What does all of this add up to? LVL’s Wolfberry valuation conservatively ranges from $1.07/share to $1.32/share and Mitchell Ranch adds from $0.48/share to $0.95/share totaling a range of $1.07/share (no value assigned to MR) to $2.27/share! Obviously, an upside to today’s share price. One last thing to keep in mind… With Chesapeake focusing on acreage outside of the Permian Basin, it would not be surprising if they let their Mitchell Ranch term assignment expire. Should this occur, our view is that this would be a positive by increasing LVL’s Mitchell Ranch exposure by 17,000 net acres.